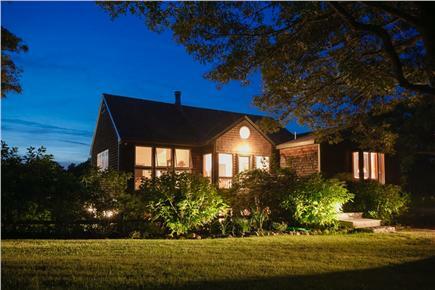 Vineyard contemporary with privacy and long views across the water. 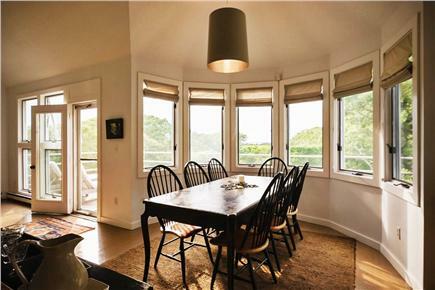 High ceilings and expansive windows invite light and island breezes. Enjoy awesome sunsets from the decks and all living areas. Every room is a stylish ''Crate and Barrel'' showcase with 4 bedrooms including 2 private Masters with ''ensuite'' bathrooms. 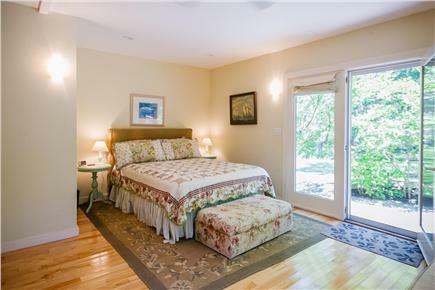 The setting is a pastoral hillside meadow with gracious old oaks and mature gardens. Our private Makonikey association beach sits between Tashmoo Pond and Lamberts Cove Beach. The calm shores are perfect for kids, kayaking (2 come with the house!) and long walks. Walk from our front door to the water in less than 5 minutes down dirt paths. 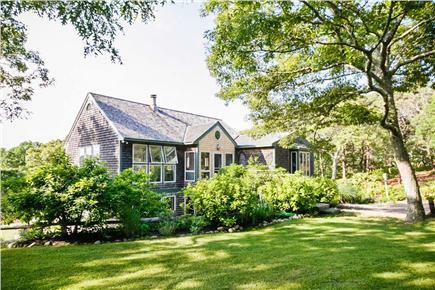 Vineyard Haven is convenient for shopping, movies, etc., yet the house is privately situated on over 3 acres without a neighbor in view! This house is perfect for a magical family getaway. All furnishings, linens, kitchenware, etc. are top notch! Easily accommodates 2 families and sleeps 10 without compromising privacy. Additional pricing info: State and local taxes of 5.7% will apply. 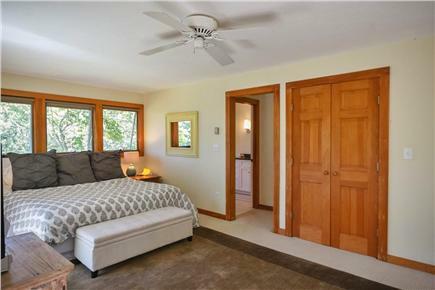 Truth be told, I was conflicted about writing a review for this house...torn between wanting to sing the property's praises and (selfishly) not wanting the word to spread so much that it would make it more difficult to rent in the future! The best way to describe the house is: it's a home...permanent, lived in, cared for, comfortable. Rather than feeling like a beach rental, it feels as though you are staying at a friend's house who just happens to be away while you're there. It's nicely decorated and well stocked as if the owners spend much of their time there (thankfully for us, they don't) and will be back any minute. 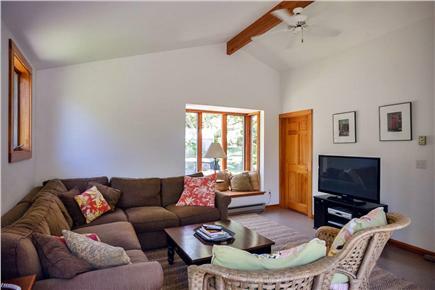 From the breezy open plan living room / dining / kitchen, to the sunny deck overlooking Vineyard Sound, to the cozy family room (perfect for binge watching Netfilx on a rainy day), it's a great house in which to spend your time on the Vineyard when you're not out experiencing all that the island has to offer. The four bedrooms on the lower level (including two master bedrooms, each with en-suite bathrooms) are comfortable and quiet with direct access to the yard and outdoor shower. My family and I have been coming to this great place for three years - we spent a lot of years looking for the perfect place for us with our three young children, and this is it. 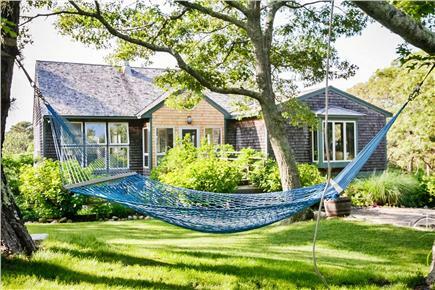 The house has everything we love - great deck, modern amenities, beach close by, washer/dryer and a great view. The yard is expansive and really feels like you are away from all the distractions of everyday life. We can't wait to go back.